Every month, a different set of free phonics sheets! This month’s set of free sheets, Same Two Letters, is ideal for children playing levels 5 and 6 of the interactive Froggy Match-it app. The tasks focus on adjacent consonants, words such as ‘lost’, ‘trap’ and ‘band’, and are useful for any children who are at this stage of their phonics learning. Get them here. 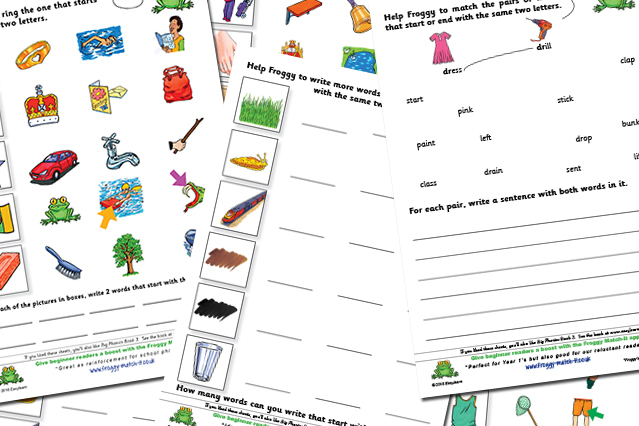 Each month we give away a set of extra, free worksheets that help with literacy skills and which tie in really well with particular levels of the Froggy Match-it games. These are in addition to the free writing sheets which accompany each level of the app. These free, extra sheets are available from the Froggy Match-it website. Parents and teachers who follow us on facebook or twitter will get the download link for each new set of worksheets as they become available each month. Alternatively, subscribe to our newsletter.